This suit is crafted with a classic 2 button jacket with satin covered buttons, notch lapels and a single center back vent. The jacket is styled with outer flaps for the lower pockets and the chest pocket is designed with a matching solid satin pocket square. Trousers for sizes 2T thru 20 are a plain front pant that do have belt loops and are crafted with a fly front for easy comfort. The sizes for toddler and young boy sizes have an enhanced waist band with elastic in the back waistband. The young men's sizes have a sized waistband with no stretch. The baby pants have a full elasticized waistband for easy comfort and better fit. All Trousers have a finished hemline which is designed for very easy hemming if needed. Matching satin covered button front vest is include and fully lined. The neck tie with this suit is a beautiful crafted clip-on embroidered religious cross dress tie with a matching solid satin pocket square. Included is a traditional long sleeve; lay-down collar white shirt made of 35% cotton, 65% polyester fabric. This boys white suit is available in sizes Baby Small 6-9 Months, Baby Medium 9-12 Months, Baby Large 12-18 Months, Baby X-Large 18-24 Months, 2 Toddlers, 3 Toddlers, 4 Boys, 5 Boys, 6 Boys, 7 Boys, 8 Boys, 10 Boys, 12 Boys, 14 Boys, 16 Boys, 18 Boys and 20 Boys. Refer to Tuxgear's Size Chart located in Photo Section. This beautiful white boy's communion suit is in stock and ready to ship! Available in Sizes 6 Months to Young Men 20. Refer to Tuxgear's Size Chart located in Photo Section. 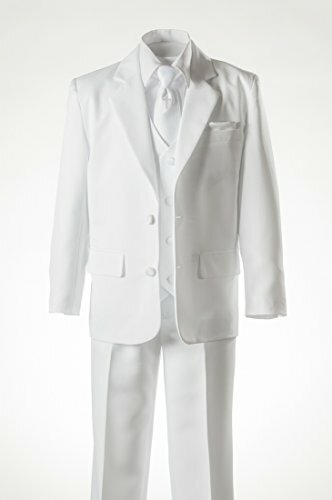 Boy's white communion suit includes jacket, pant, shirt, vest, dress tie and pocket square. This is a High Quality Beautiful Suit and Perfect for your Boy's Special Day!